The housing market ended on with mixed results in 2015, depending on the type of property. 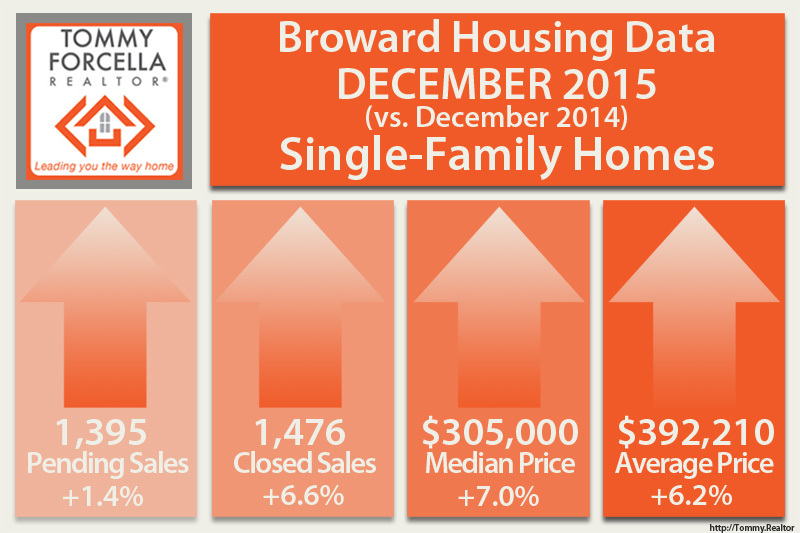 Broward County property statistics show that single-family home sales were up 6.6% over December 2014, with corresponding positive markers showing increases in median & average sale price, reduced days on market, and a higher percentage of list priced received. The market for distressed property continues the trend of fewer short-sales, with a 44.7% drop in closings of this type. Foreclosed properties showed a small increase of 12.5%, from 232 to 261 closings. Traditional closes sales on single-family homes are at a healthy 12.4% improvement from December 2014. Inventory levels continue to see sharp declines over last year, with almost 10% less single-family homes available for current buyers. This is only 4.1 months supply of inventory, 18.5% lower than December 2014. It is leaning more towards a seller’s market for single-family homes going into 2016. The condominium market is seeing some improvement, however sales are 4.1% less than December 2014, and Pending Sales have dropped 7%. Median sales price effectively is unchanged, and condos are typically on the market for 47 days before selling. Condo inventory is a bit stronger than last December, with 8,551 units on the market, representing a 1.5% increase in active condo listings. There are 6 months of condo inventory, meaning we have a balanced market. Short-sales and foreclosed condo sales both decreased over last year. Of all condo sales in December 2014, there were 34.8% fewer short-sales and 21.4% fewer foreclosure/REO sales than December 2014. These drops make up most of the total decrease in condo sales over last year, as traditional condo sales only increased at a rate of 2.2% compared to December 2014. 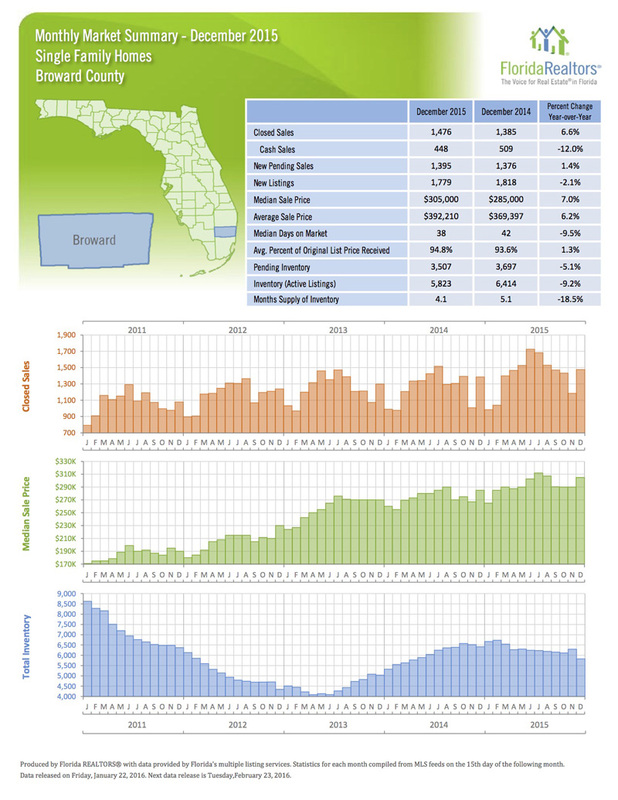 You can read and download the December 2015 Broward Market Statistics for FREE. LOOKING TO BUY A HOME OR CONDO IN SOUTH FLORIDA? LET ME MAKE IT SIMPLE FOR YOU. CONTACT ME TODAY AT 954-632-5100.